On all accounts the JR Iditarod was a great success. At the Sunday evening banquet, Race Marshal, Cim Smyth, whole-heartedly congratulated the young mushers on a job well done. 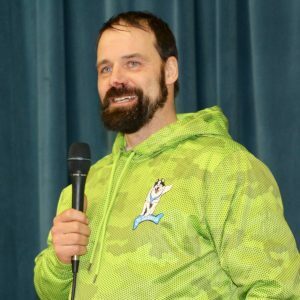 Cim has raced in the JR Iditarod and is a former champion – he knows racing and he knows mushers. Cim said, “Everyone came through with flying colors. This outdoor thing, being out there by yourself and getting the job done, is a great life lesson. That’s what the JR Iditarod is all about.” He praised the young mushers for their excellent dog care and their dog driving skills. For Bailey Schaeffer, the third time was a charm. Arriving in Willow at 13:47, she earned gold on her third JR Iditarod attempt. Schaeffer dropped down onto Willow Lake with a very spirited dog team. Her leader, Bill, sensed the finish, leading the team in a fast trot across the lake on the well-packed trail. Family, friends and fans under the finish banner at the boat landing greeted Schaeffer. 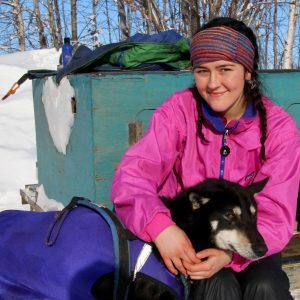 Much earlier that morning, Bailey was the third musher to depart Yentna Station behind Grace Nolan and Colby Spears. Team Schaeffer passed Colby Spears before reaching Eagle Song. Then she over took Grace Nolan before reaching Hunter Trail. Schaeffer and Chandler Wappett both checked into Hunter trail at 11:46. From there the race was on between Schaeffer and Wappett who departed Hunter Trail at the same time. As Champion, Bailey received a $6,000 scholarship. Neither Schaeffer or Wappett elaborated on the final leg of the race but the stats show how close the race was all the way to the finish. Bailey, with nine dogs, covered the final 18 miles in 2 hours and 1 minute at an average speed of 8.93 miles per hour. Chandler with ten dogs covered the distance in 2 hours and 3 minutes averaging 8.78 miles per hour. There you have it, Schaeffer claimed the championship by two minutes with an over all run time of 27 hours, 25 minutes and 23 seconds. Veteran racer, Colby Spears, claimed third place edging Rookie Grace Nolan by 12 minutes. In 2017, Colby was runner up in the JR Iditarod to Andrew Nolan. Spears received a $2,500 scholarship. Claiming 5th place was Emma Shawcroft. As a rookie in 2017, Emma arrived at Willow in 3rd place. Emma was one of the many mushers who commented on how excellent the trail was. Granted, with a couple of inches of new snow, the trail was several hours slower than in 2017 but it was impeccably groomed and faultlessly marked. Credit for the trail work goes to Richard Plack and his tireless trail crew. Emma received a $1,500 scholarship. Anna Stephan returning for her second JR Iditarod finished in 6th place. She improved three places over her rookie run in 2017. Anna was very happy with her race, very happy with her dogs and very happy with finishing in the middle of the pack. She personally enjoys cross-country running. That was apparent as she assisted her dogs by jogging up the many hills next to the sled. Charmayne Morrison behind a team of Kathleen Frederick dogs claimed 7th place. Morrison, a rookie from Montana, really enjoyed the race and very much appreciates making new friends through the JR. Iditarod. Mikah Whitehead, a former Texas resident, claimed eighth place. This was his first competitive experience but one would never have known it watching his sled driving abilities, camping skills and dog care. Mikah has a mentor with almost ageless Iditarod experience in Jim Lanier. Jim praises Mikah’s natural abilities with dogs and his capacity to think ahead and see what needs to be done. Mikah was driving a signature all white dog team from Lanier’s Northern Whites Kennel. Most of the dogs will accompany Jim to Nome in the 2018 Iditarod. Talia Martens traveled from Wisconsin to participate in the JR Iditarod. Claiming 9th place fulfills her dream of running her own dog team in Alaska. This race and the new friends made during the race is something she’ll always remember. Lara Renner from New Hampshire, behind her team of Siberian Huskies, finished in tenth place. Before the race started, Lara’s goal was to simply finish. She certainly met and exceeded that goal. Her Siberians were very energetic and had quite the charming personalities. As the team climbed up the riverbank into the halfway checkpoint, her dogs were energetic and ready to mush on. The same was true when she reached the finish line. The dogs, with tails flagging and heads high were barking enthusiastically and leaning into their harnesses. They seemed to be saying, “WOW that was awesome, why are we stopping?” Compared to New Hampshire, Lara thought the trail was rather flat. Receiving Red Lantern honors was Christina Gibson with a time of 30 hours, 34 minutes and 50 seconds. The span from first place to eleventh place was just over 3 hours and 5 minutes. The race was tight at the halfway point but spread out slightly on the return trip thanks to faster trails. Christina said the race was a pretty great experience. Christina was chosen by her fellow mushers to receive the Sportsmanship Award. Christina was a joy to be around and went above and beyond in making sure the camping area at Yentna was especially clean before leaving. Christina received a $2,000 scholarship recognizing her sportsmanship. The Blue-harness was awarded to Bailey Schaeffer’s leader, Bill. Bailey characterized Bill as a dog who is a middle age athlete. At times he’s a command leader but his real job up front is to line the team out and hold them. Veterinarians honored Bailey Schaeffer with the Humanitarian award. She was not only surprised but also honored and humbled. Bailey’s father, Iditarod veteran Chuck Schaeffer, was very pleased and proud of Bailey as was her mother. Chuck has been especially impressed with the progress she’s made in dog care over the past couple of years. The humanitarian award winner received a $2,000 scholarship. While on the trail, the goal of the mushers should be a relatively flat time – similar run time out and similar run time in. With trail conditions drastically different between the two days of the JR Iditarod, what normally is an easy comparison of times required serious mathematical calculations. 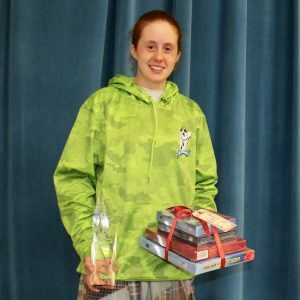 The initiator of the award, Danny Seavey, analyzed the data and selected Emma Shawcroft as the Winner of the Seavey Flat Time Award. Emma received a $50 Cabelas gift card supplied by Seavey. The JR Iditarod saluted Bernie and Jeannette Willis as honorary mushers. For decades, the Willises built the sled and fashioned the sled bag that was given to the race champion. 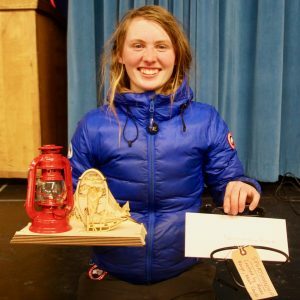 As mushers themselves, they were able to express their knowledge of the sport and passion for the sport in the beautiful functional products they created. Bernie shared a story about their son, Tony, who had received scholarship money from the JR Iditarod. Tony applied the money toward training for his private pilot’s license. He is now a pilot for Alaska Airlines. The Iditarod Trail Funding Committee generously sponsors the JR Iditarod and provides funds for scholarships and special awards. The monies awarded to the mushers can be used for higher education or special training. Planning each year’s race takes a monumental effort from a large number of people. The JR Iditarod Board Members would like to extend a personal thank you to each and every volunteer and supporter who has helped coordinate and make this a quality event for young mushers.